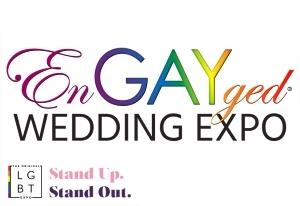 Samantha + Alexandria - 2015 EnGAYged Wedding EXPO Giveaway Finalists! Ok I hope this will be my entry lol. 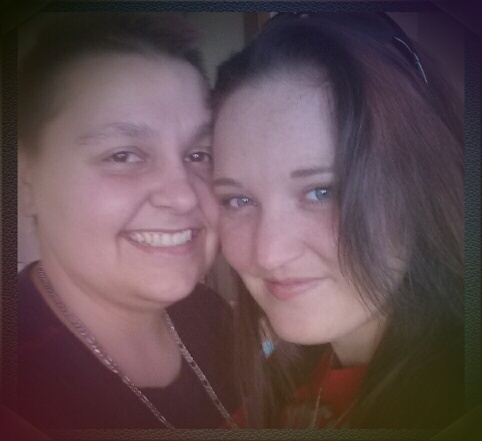 My name is Samantha and my fiancée name Alexandria we have been together 4 years and have a beautiful 6 yrs. old. Our love story begin 5 years ago and we both like to go dancing and she was on a date with someone else and I noticed she was sitting down and looked like she really wanted to dance, her date however only dances one song, so when I was finished dancing with a friend, I walked over to her and simply said "since she won't dance with you, would you like to dance?" She almost forgot she was on a date lol, so she looked at her date and asked her date had no problem with it so we danced, well a week went by and she had a job interview the same place I worked, and we saw each other again, well another week went by and I had been at work all day, it was evening time when someone told me I had a phone call, so I go answer the phone the way I'm suppose to lol, and she asks me if I'm going to Cactus(the place we met) I said you already know lol. Well when I arrive I'm nervous as heck, cause she's so beautiful and I'm not use to this and she's already kind of buzzed lol we dance the night away, when it comes time to close the club she tells me you either coming home with me or giving me a kiss, I went with the kiss, I can already tell she doesn't need to drive, so I have friend take her home , and it was pretty hard to convince her to leave her car lol but she does and we exchange numbers and I asked her to let me know she got home safe and she does. Well its the next day and I'm at work and she doesn't know if she's going to be able to come get her car, so I call around and my dad says here baby go get her, and as I'm fixing to leave my job to go get her, she calls me to tell me she found a ride, so she comes back to Victoria and we meet yet again at Cactus to dance, well we got a hotel room and stayed the night together for the first time, and we hang out all day on Sunday, she finally looks at me and says " so are you going to ask me to be your girlfriend yet" lol, so I do and we have been together ever since!! !